Sketch the equipotential lines for the two equal positive charges shown in Figure 19.33. Indicate the direction of increasing potential. 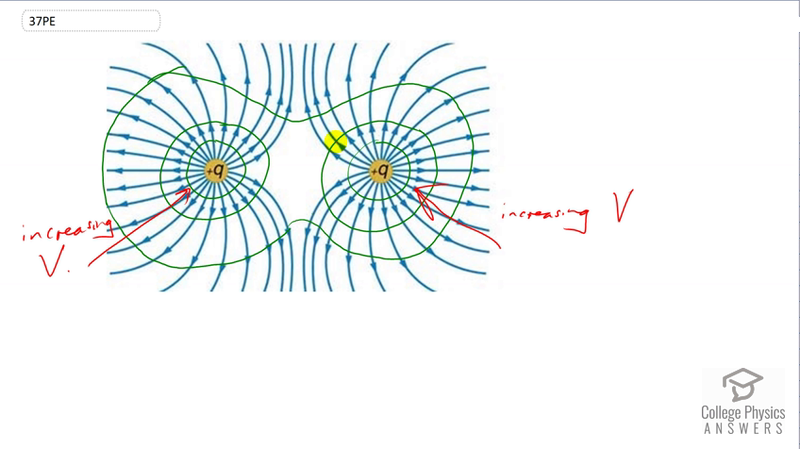 Figure 19.33 The electric field near two equal positive charges is directed away from each of the charges. This is College Physics Answers with Shaun Dychko. Equipotential lines are lines along which the electric potential are the same and they are meant to be at right angles always to the electric field lines and so as we go around this charge, we should be trying to make a right angle to every single field line that we cross and close of the charge its pretty clear what to do because all these lines are basically going radially outward from the charge and so, umm… going at right angle to those radial lines is gonna create a circle. As you go further from this charge, things get a little bit more complicated though, umm… and in this position particularly, there… this line tends to go further this way than it did here, its losing some of its curvature downward, so its kind of… kind of bulging out there, maybe I didn’t draw that quite so clearly but its meant to be bulging out here and then it changes as it get further away to the point where… for this one going at right angles to this, brings us at this… in this direction starting here whereas when you look at this electric field lines, its going in this direction and so we are just extrapolating between the two points by making this curve. Oops… that was no good. Let’s do that, good. So, umm… we are increasing potential as we get closer to these positive charges because if you consider just one charge, the formula is V equals coulomb’s constant times charge divided by the radial distance from the charge and that’s why as you get closer to a single charge, the potential increases and when you look really close at this single charge then you can basically ignore this charge is there when you think about it this way. Umm… the only fact that this charge has on the potential due to this one is that its creating at a far distance away, this sort of curve, dumb down sort of looking picture and as you get really really far away from both these charges, it will actually look like a single point charge eventually of magnitude two q and then really really far away the equipotential lines would again look like regular circles. So, I think that answers the question. So, here we go.